The most important development has been Medvedev’s election to the Presidency with 70.2% of the vote. While it has not been squeaky clean (and as such, no different from any other Russian election under either Yeltsin or Putin), the more hystryonic claims of voter intimidation are to be treated with a pinch of salt – for a start, it’s a secret ballot, and as such authorities can have no control over how people vote in the booth. Even Nigel Evans, a British parliamentarian and member of PACE’s monitoring team, admitted “There does not seem to be any voter intimidation“. Media coverage has been skewed towards Medvedev (who was a key government official – deputy prime minister – as well as election candidate), but this is not surprising in a country where opinion polling typically put his popularity at around 80%, in contrast to Zyuganov’s c.10%, Zhirinovsky’s c.10% and the ‘Liberals” c.1%. (This is also the reason Medvedev refused to participate in TV debates). The elections followed the polls, which heavily suggests that they were free. In fact, the major upset was Zyuganov, who managed to scrape 17.8% (well above what most polls predicted) to the detriment of Medvedev. Now Russians do get coverage of the latters’ platforms and as such it is not surprising they are rejected – the Communists talk the talk but can’t walk the walk; the Liberal Democrats are too crudely clownish to have genuine popular appeal; and the ultra-low ratings of ‘liberals’ is largely of their own making. After all, the media reflects, as well as manufactures, consent. Edit: now the Western media resorted to whining about police detaining opposition protestors in Moscow. All I will say on the matter is that the Moscow protest was unsanctioned and as such is illegal, and any self-respecting country would enforce that. In contrast, the St.-Petersburg liberal faction did bother getting official permission to hold a rally, which went off peacefully. Of course, if you do get permission, then you won’t get to see your face in the Western press whining about the injustice of it all – a particularly pertinent point, because it often seems that ‘liberals’ like Kasyanov and Kasparov care more about their Western constituencies than Russians. An oligarch dies in his Surrey mansion. Although at first he supported the new reforming President with financial and media resources, he later turned against him, accusing him of sliding into authoritarianism. In turn, he was charged with plotting a coup in his native country and has since lived in self-imposed exile in the UK and Israel. He claimed he was the target of an assassination attempt orchestrated by elements of his homeland’s government, and this was even supported by a tape (albeit of uncertain authenticity). Which country? Mr Patarkatsishvili lived in Russia between 1993 and 2001. In the 1990s he was wanted by Russian authorities on charges of theft from the country’s largest car factory, AvtoVAZ, which he ran with Mr Berezovsky. He was also accused of plotting to arrange the escape from custody in 2001 of Nikolai Glushkov, deputy director of Aeroflot, Russia’s national airline, who had been accused of fraud. The man charged with breaking out Mr Glushkov was Andrei Lugovoy, who was arrested and jailed after the attempt failed. Mr Lugovoy is wanted by the British Crown Prosecution Service for the murder of Litvinenko, the dissident former Russian spy poisoned in London with radioactive polonium-210 in 2006. Mr Lugovoy was responsible for protecting Mr Patarkatsishvili and Mr Berezovsky at the time as head of security at the Russian TV channel ORT, which the two men controlled. Mr Patarkatsishvili remained good friends with Mr Lugovoy, a former KGB officer who is now a member of the Russian parliament. The pair were seen socialising together in Tbilisi, the Georgian capital, shortly before Mr Litvinenko was poisoned. Mr Litvinenko also had links with the Georgian businessman. Sources in Tbilisi have told The Times that he stayed at Mr Patarkatshvili’s residence in Georgia en route to Turkey when he fled Russia to seek asylum in London in 2000. Russian prosecutors claim that Mr Litvinenko also visited Mr Patarkatsishvili as well as Mr Berezovsky in London shortly before he was poisoned. They accuse Mr Berezovsky of involvement in the murder of the former Federal Security Service (FSB) agent as part of a plot to damage President Putin’s international image. Georgia’s former Defence Minister, Irakli Okruashvili, accused Mr Saakashvili of encouraging him to kill Mr Patarkatsishvili in 2005, although he later retracted the claim. Really makes one wonder who’s for who in these circles. If indeed he was murdered (there are, after all, chemical agents capable of causing heart attacks without detection), who did it and what was the motive? Georgian security officials concerned at his plotting of a new color revolution (they claim he was caught offering 100mn $ to a police chief to support opposition demonstrators; Badri claimed it was a honeytrap)? (For – want Saakashvili to remain in power, cast suspicion on Russia; against – risky, does Georgia even have the means?)? Elements of Russian intelligence services to discredit Georgia (For – despite recent thaws, Saakashvili is still set on NATO accession; against – Badri is damaging enough to Georgia alive, wouldn’t they have made a Georgian connection much more explicit than a random heart attack, risky)? Berezovsky (For – discredit Russia, last person to see Badri alive, a history of people inconvenient to him dying; against – risky, Badri is enemy of Saakashvili who is enemy of Putin, as is Berezovsky)? Some mafia or another (Badri’s own past is far from squeaky clean – many Georgians consider him a mobster)? But ultimately I suspect this was a genuine heart attack, his feud with Saakashvili not rising above black PR. He had a family history of cardio-vascular disease, didn’t exercise, chain smoked and probably subsisted on a traditional (read: lethal) Russian/east European diet. But ultimately this is a murky case and I doubt anything definitive will ever come out of it. The same cannot be said of the Western media, which is transparently Russophobic. Far from blaming the ‘authoritarian’ Georgian government (about whom, after all, there is direct evidence in the form of aforementioned tape), some totalitarian publications kicked their smear campaigns into full gear immediately – against Russia! Mixed in with unrelated rants against Russia’s closure of British Council offices and its constitutionally mandated refusal to extradite Lugovoi, the point is implicitly made that the FSB, if not Putin himself, are behind the death of Patarkatsishvili – ‘a sworn enemy of Russian President Vladimir Putin’. No mention of Georgia. Eventually, all memory that Saakashvili and elements of the Georgian security forces are also linked to Patarkatsishvili will be erased. Russia will stand guilty before the world, because who controls the present controls the past, and who controls the past controls the future. Just like in 1984. And so the Annals of Western Hypocrisy go on. Talking about hypocrisy, lunatic Lucas also insisted on having a say in the British tabloid Daily Mail. I’ve replied to it on his blog. Speaking about assassinations and stuff, it seems the traitorous slime Gordievsky has crawled out from under his rock to whine about how he fears he will be next Alexander Litvinenko. The other main news is the declaration of independence by Kosovo from Serbia, which has been recognized by the US and the major West European countries. I’ve compiled a map below (dark green = recognize; green = say they’ll recognize; red = states insisting on further negotiations under UN auspices; dark red = don’t recognize). Note: Georgia, Azerbaijan should be dark red – forgot to add them in. Sorry. Firstly, we are against recognizing Kosovo because it a) violates the principle of national sovereignty – the dominant paradigm of international affairs since the Congress of Vienna, b) sets an unwelcome precedent in which aliens can take a chunk out of a country by outbreeding the original denizens over generations (particularly pertinent to places like the US South-West or Londonistan), c) unfairly punishes a politically modern Serbia for the transgressions of a previous regime and d) rewards the likes of Thaçi and his KLA cronies, the former terrorists and drugpushers who now run Kosovo. Unfortunately, Serbia has little choice but to acquiesce to this as a fait accompli. However, if I were a Serbian policymaker, I would continue down the road to European integration (after all, no need to cut off the nose to spite the face), but refuse to recognize Kosovo, assert it as eternal Serbian territory in the Constitution and maintain charges of treason against the Kosovar leadership. Similarly, if Serbia joins the EU or even NATO, it will remain a Russian ally and can function as a Trojan horse in these organizations (as Bulgaria is alleged to be). As such, this is the best course for Russia to pursue, at least until it regains its superpower status. Finally, no, this does not mean that Russia should now recognize de facto independent states like Abkhazia, South Ossetia or the Dniester Republic. Since it has positioned itself firmly on the side of state sovereignty (as opposed to Western ‘liberal interventionism’), appearing to switch sides on particular cases like Abkhazia or South Ossetia will undermine its principled stand (as seen by the international community). Furthermore, this is compounded by the fact that both Georgia and Moldova, quite wisely, have also refused to recognize Kosovo. The same applies to Crimea and the Ukraine. Lenin once said that the capitalists will sell us the rope by which we’ll hang them. Russophobes kindly give it away for free. The BBC World Service has conducted a poll across 31 countries to assess Putin’s legacy as he steps down from the Presidency – you can read it here. The first part of the poll, conducted in 31 countries including Russia and the G7, dealt with the influence of President Putin on various aspects of Russian and global affairs. Two of these aspects stand out in particular: They are the quality of life in Russia and democracy and human rights situation in Russia. Why do they stand out? Simply because they are an internal Russian matter, i.e. one has to actually be in Russia in order to form a sufficiently educated and hopefully accurate opinion on the topic. Global affairs are anyone’s fair game, but internal situation in any country needs to be assessed from within. Logical, isn’t it? So what data are we dealing with here? When it comes to Putin’s influence on the quality of life in Russia, 77% of Russians hold a positive view of it, and 8% — negative. Of the residents of G7 countries, on the other hand, only 39% hold a positive view, while 44% are negative. On to democracy and human rights: 64% of Russians think Putin’s influence was positive, while 12% think it was negative. The residents of G7 countries, once again, beg to differ: only 26% have a positive opinion, while 56% think that Putin strangled the nascent Russian democracy, personally butchered 200 Russian journalists and 500,000 Chechens, and also poisoned the “KGB spy” Litvinenko with polonium had a largely negative influence. It’s all clear with Russians: if a Russian wants to form an opinion of his quality of life, for starters he can open his fridge and compare its current contents with what was in it in the 90s. Or he can look at his paycheck. Or vacation time. Or the feeling of security. Same with democracy — in Russia, one can simply look out the window, and there they are, Russia’s democracy and human rights, out in full force! But if one lives in a G7 country, how can you look into a Russian’s fridge? How can you look out a Russian’s window? Well, probably a million of G7 countries’ citizens have visited Putin’s Russia by now. Tens of thousands have stayed long enough to form an educated opinion of what it feels like to live in Putin’s Russia. But that is such a drop in the bucket compared to the entire population! You can figure out what it says about the state of Western journalism by yourself. (If not, continue reading Fedia’s post). 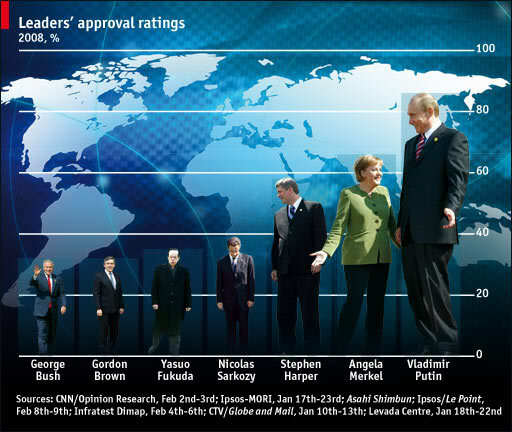 The Economist has also joined the party with this graph of leaders’ approval ratings. Putin, quite literally, stands head and shoulders above the rest. (Note how those who preach to Russia the most about democracy tend to put up less than impressive performances). Putin’s popularity can be partially attributed to the fact that he has closed down, taken over, and otherwise muzzled the media in Russia and that some of his most vocal critics have been silenced in the most permanent and brutal of ways. The murder of Anna Politkovskaya serves as a warning to any who dare to criticize Putins policies and chills all substantive debate on what is best for the Russian people. – vfisher. Love this – just the right blend of ignorance and self-righteousness, of truthiness. A true Westerner. 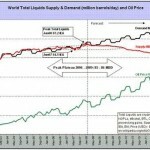 In fact Putin’s popularity will last as long as crude oil stay high. In reality most of the Russians live at a very low standard compared to developed countries and even countries like Poland, Greece etc. But combination of oil money ingections though social payouts and massive propaganda makes Russians feel happy. Believe these Russians that can think independently are not fan of Putin and his totalitarian state. – Olexiy, Kiev. A Ukrainian talking to Russians about prosperity. Rolls eyes. Rather than rqnking leaders by popularity (usually ephemeral, often suspect), why not rank them by policies and performance in dealing with their countries’ problems. Harder work, longer term, but surely much more worthwhile. After all, Hitler was pretty popular in Germany until he lost the war. – Plein d’Espoir. At least they’re very reliable at proving Godwin’s Law. Have you considered for a moment that most Russians would be afraid to say they didn’t like Putin? I’m sure Hu Jintao also has wonderful approval ratings too. – cdicanio. Brilliant. Now we’re being compared to China. Sometimes I wonder why they bother. Why don’t they just cut the crap and say it straight – Russians are seduced by Putin’s smile because they don’t share western values. Finally, other news in brief. Armenia’s capital Yerevan has seen protests again alleged rigging of the elections, which Western observers said was generally free and fair. Eight people were killed and martial law was imposed. I don’t have any detailed knowledge about the finer nuances of Armenian politics, so I’ll let this pass. 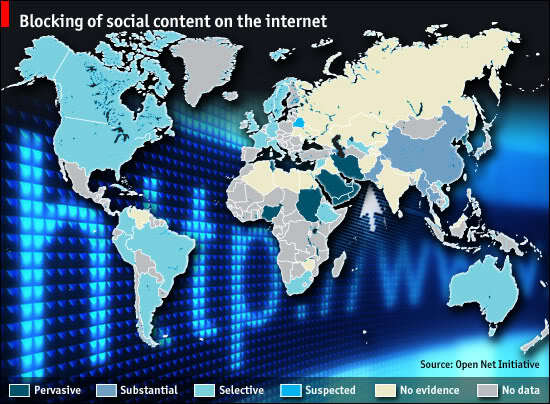 The Economist has released an interesting map showing places where Internet content is blocked. Note how Russia is the freest country in the world, at least by this measure. Russia’s population down 0.17% in 2007 to 142 mln – another nail in the coffin for the Myth of Russia’s Demographic Meltdown. Not that population decline is in itself disastrous (what matters for prosperity is the dependency ratio, for which Russia’s future projections are no worse than that of the G7); but it seems that population decline itself is nearing an end as birth rates rise and death rates fall. I would like to point out that I was almost completely right when in one of my first articles, Reading Russia Right, I said ‘totaling up the figures would give a rate of population increase in 2007 in Russia of around -0.15%’. On the military front, the US expresses concern about growing Russian military spending. Let them; I don’t care much. This is a natural response to the underspending in the 1990’s, when the military-industrial complex languished (although they did not stop R&D); even today most military modernization goes towards upgrading older systems (e.g. extending service life for ICBM’s) rather than new purchases. 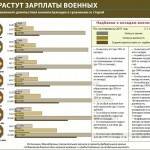 On the topic of military spending, the US is still the world’s top leader by far, spending 712bn $ in 2007; nonetheless, it should be mentioned that official figures understate Russian (and Chinese) military spending due to a) purchasing power parity differences, b) accounting tricks and c) some of it being structural. In related news, Russia has launched its first nuclear submarine since Soviet times, the Yuri Dolgoruky – two more are currently under construction, and a dozen are planned to be commissioned within the decade. Since the US is steadily building up its ABM capabilities at Fort Greely (Alaska), Vandenburg (California) and now Poland (as is likely), it would make sense for Russia to concentrate more efforts on the submarine part of its nuclear triad (as land-based ICBM’s are more vulnerable to being successfully shot down by ABM) and eventually its bomber force (on the subject of which, Russia is developing a new stealth bomber, possibly a resurrection of the Soviet Ayaks project). Russia has agreed to write off 91% of Iraq’s 13bn $ Soviet era debt, no doubt in return for Lukoil salvaging its Qurna deal. Russia’s telecoms industry is also acquiring a global presence – AFK Sistema set to become pan-Indian mobile operator, a market with the potential for massive growth in the immediate years ahead. Not related directly to Russia, but an interesting development – Chavez orders ten army brigades to the Colombian border in response to a Columbian strike against FARC within Ecuadorian national boundaries, which killed Paul Reyes, one of its main leaders. Ecuador and Venezuela also terminated diplomatic relations with Colombia. Armed forces: 207,000 (145,000 excluding non-combatant support personnel) vs 87,500 (+recent 100,000 militia) / 59,500 / 11,000 = 158,000. Columbia will have the numerical advantage, at least in properly trained personnel; however, assuming Ecuador joins in, they’ll have to fight on three fronts. Both Columbia and Venezuela have undergone intensive military modernization the last few years. Tanks: none vs. 86 outdated MBT’s, 154 outdated Venezuelan light tanks and 140 very outdated Ecuadorian light tanks. Personnel carriers on both sides obsolete. While Venezuela leads, its armored advantage is irrelevant. This is because tanks are unsuited for jungle warfare. Granted, Venezuelan wargames demonstrate that their most likely avenue of attack would coincide with conventional armored thrusts into the La Guajira peninsula, which is flat – however, this is negated by RPG’s and the large amount of Colombian fortifications there. At most it will be a diversion. 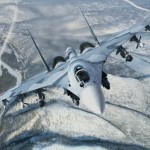 Air: 30 vs 76 fighters; mostly outdated mishmash with 90 Black Hawks vs. mostly mishmash, but with 14 modern Su-30MK2’s (with 10 more to be comissioned this year) and 10 operational F-16’s, so Venezuela will possess air superiority – its ace. Unless the US decides to get seriously involved. Naval: 3 destroyers/12 frigates/4 subs vs. 6 frigates/2 subs, 2 frigates/6 corvettes/2 subs. There isn’t sufficient naval strength on either side to effect a blockade – at least for now. (In June 2007 Chavez confirmed he intends to procure five modern Russian Kilo-class 636 subs). Hmmm…if I were Chavez I’d also try to obtain Moskit anti-ship missiles as soon as possible to deter the US from becoming involved, taking a cue from Iran. Population, GDP: 44mn, 264bn $ vs. 28mn, 263bn $, 14mn, 62bn $. Venezuela and Columbia have similar levels of socio-economic development, although Venezuela has oil – which pushes its GDP levels up to Colombia’s level, which has a larger population. Colombia’s army has little heavy equipment, being mostly designed as a counter-guerilla type force; Venezuela’s is more traditional, geared towards winning conventional wars, with extensive recent efforts at military modernization. Venezuela will possess air and probably naval superiority. Assuming no big outside actors become involved – a big if – Venezuela will very probably comprehensively defeat Colombia, especially if Columbia still has to face off FARC and Ecuador on other fronts. I doubt the US will get overtly involved, at least not unless Colombia begins to lose badly (but not too quickly). Ground invasion, of course, is out of the question – the US does not have the necessary reserves, while projecting air and naval power will take weeks. (Of course, Venezuela can play the oil card, what with today’s very tight supply – cutting out Venezuela would make oil prices sky-rocket). In conclusion, if the US doesn’t get involved – Venezuela will win. If the US does get involved, Venezuela can still win, but it will have to be quick about it. Otherwise, it will lose its key advantage – air superiority – and will end up with a stalemate at best, albeit with the world in turbulence from 200 $ / barrel oil prices. Edit: actually found an analytical article on the topic of If Colombia and Venezuela went to war, who’d win? The author is bullish on Colombia; some of the commentators lean more to my way of thinking.